I received this from my mother when she passed away in 2010, she rceived this from a lady whom she cared for until her death in 1990. The lady had went to China many times on trips , I think this dates back to Da Qing period. Please help me. I did as you said and the mark CHINA- does come off I only did a tiny bit of the A. So it was on top of the glaze. NOW what do I need to do. 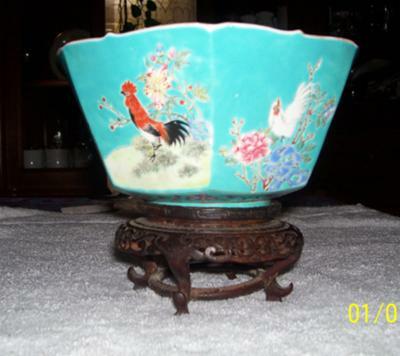 I will be looking futher into this bowl, It is of the Jiaqing period. I have searched many sites into this bowl and yet I have seen none. I will try to get better pictures of this to upload to site. Did you read my comment regarding the "CHINA" mark? Is it on top or below the glaze? What I meant is that CHINA could not have been used before the 1880s. Not any western characters would have been added before that. If it is below the glaze, it means it was added at the time the bowl was made, which in turn means it cannot have been made before the 1880s...which again means it could not be Jiaqing. I have never seen such a decoration. It would be necessary to see more details, like a rooster and partial decoration closeup. 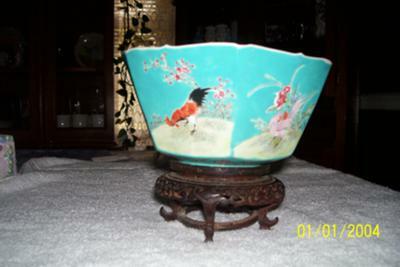 Further, a closeup of the bottom, mark and foot rim, the top rim and interior. As the image size of this blog is limited, you could post high resolution pictures to Photobucket or a similar image site and post the link here. Or, you can do more than one submission with pictures. Currently, the pictures are too small to say anything for sure. Just one thing, the blue background would have been popular around the second and third quarters of the 19th century. The mark seems to be Jiaqing first quarter. But the "China" would be late or end of 19th century at the most. 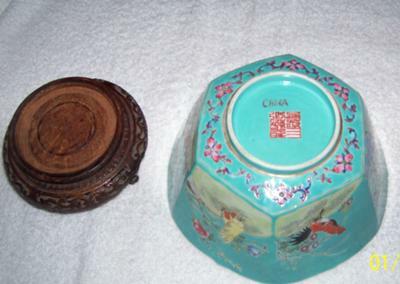 Is the "China" mark applied on top or below the glaze? If you use alcohol or acetone, or a needle to scratch the mark lightly, does the color come off? This shouldn't damage the item itself, but may shed some light whether the "China" mark was applied before or after firing. This in turn is crucial to the possible age of this item. Hi Mary, sorry to say that your piece is fairly new, from the pictures, the porcelain looks new to me and with close up pictures even if it was older, it couldn't be more the the 1st half of the 20th century, sorry to say. Maybe Peter can shed more light.